Frederick Landseer Maur Griggs, RA, RE, etcher and illustrator, was an influential artist in the English Romantic tradition, and one of the most respected etchers of his generation. He was born in Hitchin, Hertfordshire, in 1876. He studied at the Slade School of Art and worked for two years 1896-8 in the architectural office of C.E. Mallows, the architectural draughtsman. He largely abandoned architecture in favour of drawing and illustration in a visionary tradition deriving from William Blake and the 'Ancients'; his followers Samuel Palmer and Edward Calvert. From 1900 he worked on pen and ink illustrations to 13 volumes of theHighways and Byways series of English regional guides for Macmillan's, the publishers, beginning with his native Hertfordshire. He arrived in the Cotswolds in 1903 to work on the local volume of the series, and elected to settle in the changeless wool village of Chipping Campden, where a communitarian Guild of Handicrafts had already been established by C.R. Ashbee. In the Cotswolds he became closely associated with Ernest Gimson, whose interest in the traditional methods and materials of building he shared, working in partnership with him from 1917 to 1919. He lived at Dover's House in Campden High Street from 1903; from 1927-37, he designed for himself 'New Dover's House', one of the last of the great Cotswold Arts and Crafts houses, which he described as "a sort of life's work for me". His fastidious concern for the minutiae of the project left him close to financial ruin. 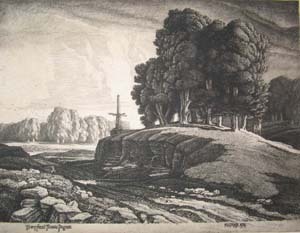 He set up the Dover's House Press, where he printed late proofs of the etchings of Samuel Palmer, as well as his own work. 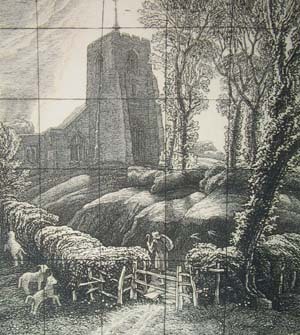 In 1912 he became a Catholic and took up etching with passion, becoming a leader in the British etching revival, "the most important etcher who followed in the Palmer tradition" (K.M. Guichard, British Etchers, 1977). He produced a highly-wrought body of etched work, 57 prints in all, technically unchallenged, depicting idealized Gothic buildings and landscapes. They capture a vanishing England of a brooding spiritual intensity, harking back to an idyll of vanished dreams. Vividly realized, they evoke the "silences of noons", haunted by a hidden god, dehumanized. 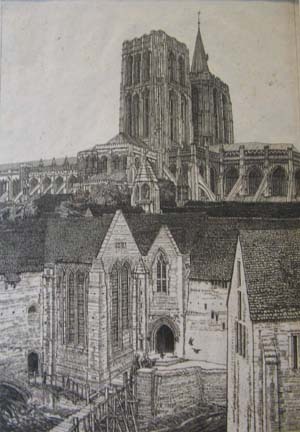 He executed some architectural design work, mainly in and around Chipping Campden, including signage and war memorials. He was an early champion of the cause of conservation: an executive member of the National Trust, the Society for the Protection of Ancient Buildings, and the Council for the Preservation of Rural England (whose letterhead he designed). He was Master of the Art-Workers' Guild, and one of first etchers to be elected to full membership of the Royal Academy. He founded the Campden Trust in 1929 with Norman Jewson and others, and did much to preserve the town and area; in particular he saved from development in 1926 the local landmark Dover's Hill, where the Cotswold "Olympick" Games had taken place since about 1612. 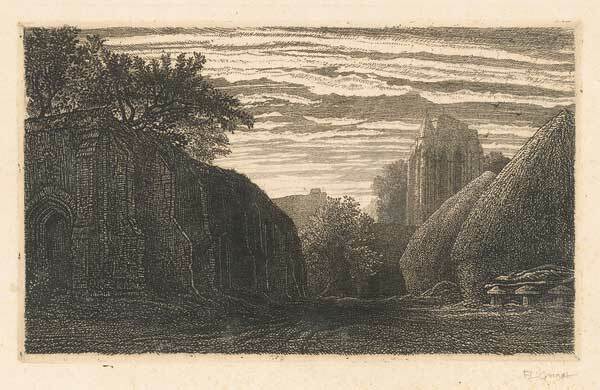 Griggs was influential in the reappraisal of the corpus of the late etchings of Samuel Palmer. His reputation is secure as an interpreter of the visionary pastoral of the Turner of the Liber Studiorum and Blake. He occupies a pole position between them and the younger generation of neo-Romantic artists, including the early Graham Sutherland, and the group of printmakers which includes Paul Drury, Joseph Webb, Robin Tanner and John Piper. He died suddenly in 1938, as the England he celebrated was about to be torn apart by war. His widow Nina was a close friend of Norman Jewson, and kept in touch with the owners of Owlpen to the time of her death in Barnes in 1988. A haunt of ancient peace. I never saw a house that so answered to that much abused description. I've dreamt of it, & of a rendering that might capture some of that wonderful wistfulness & beauty. So tomorrow Nina & I and a friend-pupil named Comstock are going there in the hope of being able to draw it in the few hours of daylight there are now. To my friend NORMAN JEWSON, who, with one only purpose, & at his own cost & loss, possessed himself of the demesne of OWLPEN | when, for the first time in seven hundred years, it passed into alien hands, & with great care & skill saved this ancient house from ruin. Norman Jewson told his friend Margaret Smith that the etching was "magnificent". Griggs worked slowly and, as he describes in the dedication, "with great care and skill". The final, published, state of the etching was completed on Corpus Christi, 1931, without the dedication below the subject, and printed "with all sorts of difficulties" by November of that year. 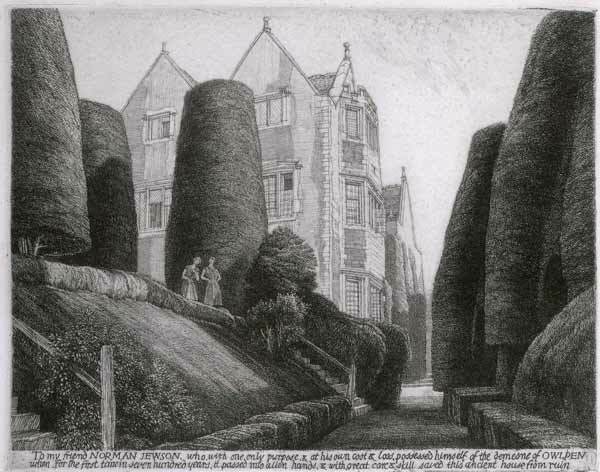 The etching is one of Griggs's most powerful, haunting images, with the gabled manor house overwhelmed, born down upon, by the neatly-trimmed yews to create an airless, claustrophobic sense of tension, relieved a little by the two female figures with bobbed hair (modelled on the miniaturist, Joan Ayling). The architectural topiary, framing the building like the pillars of a temple, perhaps refers to the cypress trees of Palmer's Italianate landscapes. Owlpen in its remote and beautiful valley near the Severn estuary is the epitome of romance. If Owlpen's story and substance was a romance, Jewson and Griggs appeared its conjurors, awakening its mysteries for a new generation. The image well describes the dreamy intensity that Jewson sought in his 'resuscitation' of the Tudor manor house. For aftercomers like the Country Life architectural writer Christopher Hussey (writing in 1952), Owlpen was "a dream made real", crystallising the spirit of the secret valleys of the Cotswolds, and preserving something of a dream's lovely unreality. Hussey had first seen Owlpen before it was restored "on a dark autumn afternoon in 1925", empty and sad behind a dripping barrier of yews in the bowels of the valley. He became a regular visitor. The architectural historian John Cornforth pointed out that Owlpen was one of a distinct group of early houses restored in the Twenties. Jewson, like Griggs, was of a generation of architects who combined sound knowledge and sureness of touch with intense poetic feeling. A dreamy sense of escapism is evident and Jewson was alive to the sense of enchantment, catching the spirit of place, as well as texture and period.